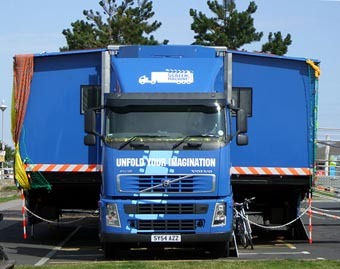 Yesterday evening the Screen Machine arrived in Nairn after having wended its way through the Highlands on an odyssey/pilgrimage which began on 1st August at Bridge of Orchy, led by Mark Cousins and Oscar-winner and Nairn resident Tlda Swinton. After a stroll up to town before lunch to pick up a newspaper, as it was such a lovely sunny and warm morning (it has clouded over and become a little cooler since then), I took a walk down the High Street and the first part of Harbour Street before cutting down onto the river and across the Merryton Bridge (for those who know Nairn well, I was obviously coming from the other side in the photograph) so I could walk down the east side of the river to The Maggot area, where the Screen Machine had been set-up in the car-parking area. Then back across the Bailey Bridge and along the shore (I walked, as I often do, in the path down amongst the dunes because few ever go there so it is peaceful and it is sheltered from any sea-breezes that may be wafting in from the beach - not that there were then as it was lovely and warm) toward the beach café and home. 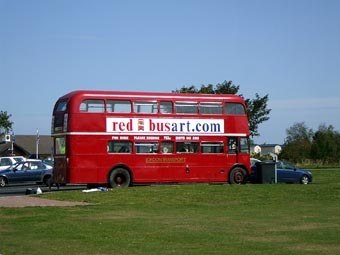 Below are a few photographs I took of the Screen Machine and the Red Bus. I am sure the cinema is wonderful and the programme looks interesting. 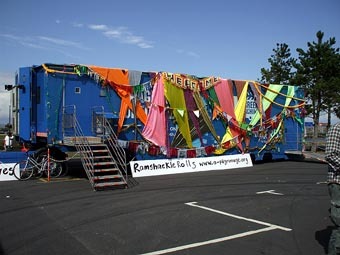 Candidly, though, I think the multi-coloured ribbons with which the Screen Machine is decorated look really weird and quite tacky, although I imagine the aim is to make what is effectively a modified truck look colourful and 'funky'. However it reminded me, I'm afraid to say, of the Clootie Well near Munlochy in the Black Isle, an area I have known since childhood, as it's where my father came from and where I have spent many holidays, and although it is considered by some to have beneficial properties I have always considered it an eyesore. Click here to see enlargements of all these photographs, where you will also find detailed descriptions of each photograph.